Sideshow World, Freak Show, Freak Central, Sideshow Performers from around the world. He was a circus performer and vaudeville comic before joining the Biograph film studio in 1915. He wrote several screenplays, then directed melodramas and adventure films (1917–25). He directed the macabre film The Unholy Three (1925), starring Lon Chaney, followed by Dracula (1931) and Freaks (1932), which established his reputation for films of horror and the grotesque. For more information about Tod Browning click on photograph. 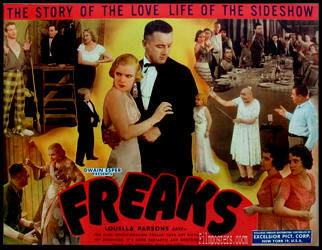 Among classic horror films, FREAKS stands alone as one of the most grotesque and the most controversial. Rarely seen since its 1932 release, and banned in Britain for thirty years, it has achieved cult status as the masterpiece of the macabre. The film features a cast of actual sideshow freaks, human-beings of every conceivable physical aberration. yet the film soon reveals that the normal members of the traveling carnival are the true monsters; pitiless, conniving and murderous! When one beautiful trapeze artist discovers one of the freaks has a small fortune, she lures him into marriage. But when she and her strongman lover plot to kill him after the wedding, the enraged freaks defend their friend and take revenge on their betrayers, transforming the aerialist into the most hideous side-show attractions of all. From the acclaimed director of the original DRACULA, Todd Browning, FREAKS is a fasci-nating drama of prejudice and injustice with a provocative and timeless moral.